dose = sbiodose(DoseName) creates a RepeatDose object and sets its Name property to DoseName. dose = sbiodose(DoseName,DoseType) creates either a RepeatDose object or ScheduleDose object based on DoseType. dose = sbiodose(DoseName,Name,Value) uses name-value pair arguments to define the properties of the dose object. You can enter the name-value pairs in the same format supported by the function set. Use the get function to view all the properties of the object. This example shows how to set up a dosing regimen that follows the first-order absorption kinetics. Suppose you have a one-compartment model with a species named drug that represents the total amount of drug in the body. The drug is added to the body via the first-order dosing represented by the reaction dose -> drug, with the absorption rate constant ka. It is removed from the body via the first-order elimination represented by the reaction drug -> null, with the elimination rate constant ke. This example shows how to set up such a one-compartment model, the first-order absorption and elimination. Create a SimBiology model named onecomp. Define the drug elimination by adding a reaction drug -> null to the model. The drug species represents the total amount of drug in the compartment. Note that a compartment and the species drug are automatically created, and drug is added to the compartment. The null species is a reserved species that acts as a sink in this reaction. Add a mass action kinetic law to the reaction. This kinetic law defines the drug elimination to follow the first-order kinetics. Define the elimination rate parameter ke and add it to the kinetic law. Specify the rate parameter ke as the forward rate parameter of the reaction by setting the ParameterVariableNames property of kinetic law object k2. This allows SimBiology to determine the reaction rate for drug -> null reaction. Add a reaction that represents the drug absorption using the second species dose. It represents an intermediate species that will be dosed directly and is required to set up the first-order absorption kinetics. Add a mass action kinetic law to the reaction. This kinetic law defines the drug absorption to follow the first-order kinetics. Define the absorption rate parameter ka and add it to the kinetic law. Specify the rate parameter ka as the forward rate parameter of the reaction by setting the ParameterVariableNames property of kinetic law object k1. This allows SimBiology to determine the reaction rate for dose -> drug reaction. Suppose you want to increase the drug concentration in the system by administering a series of doses: 250 mg three times a day (t.i.d) for two days. Specify the amount of the dose (Amount), the time interval between each dose (Interval), and the total number of doses (RepeatCount). You also need to set the Active property of the dose object to true so that the dose will be applied to the model during simulation. RepeatCount was set to 5, instead of 6 since it represents the number of doses after the first dose at the default dose start time (d1.StartTime = 0). Specify the target species of the dose object. The target must be the dose species, not the drug species, so that the drug absorption follows the first-order kinetics. Change the simulation stop time to 48 hours to match the dosing schedule. In addition, do not log the dose species data as you are mainly interested in monitoring the drug species which is the drug concentration in the system. This makes visualizing the species in a plot more convenient. To accomplish this, set the StatesToLog property to include the species drug only. Simulate the model using the dosing schedule defined by the |d1 |dose object. 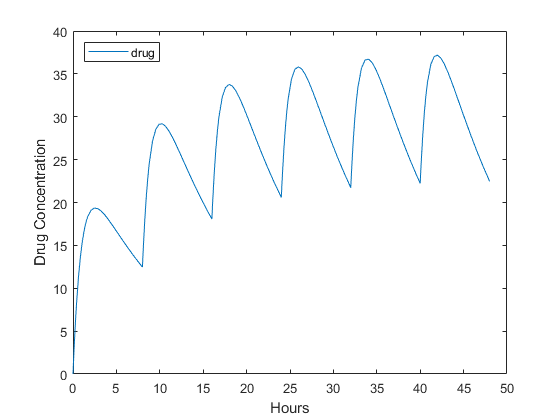 Plot the concentration versus the time profile of the drug in the compartment. This example shows how to add a series of bolus doses to one-compartment model. Suppose you have a one-compartment model with a species named drug that represents the total amount of drug in the body. The drug is removed from the body via the first-order elimination represented by the reaction drug -> null, with the elimination rate constant ke. In other words, the drug concentration versus the time profile follows the monoexponential decline Ct=C0e-ket, where Ct is the drug concentration at time t, C0 is the initial concentration, and ke is the elimination rate constant. This example shows how to set up such a one-compartment model and administer a series of bolus doses, namely 250 mg three times a day (tid) for two days. First create a SimBiology model named onecomp. Define the elimination of the drug from the system by adding a reaction drug -> null to the model. The species drug is automatically created and the reaction is added to the compartment. The null species is a reserved species that acts as a sink in this reaction. Specify the rate parameter ke as the forward rate parameter of the reaction by setting the ParameterVariableNames property of kinetic law object k1. This allows SimBiology to determine the reaction rate for drug -> null reaction. Suppose you want to increase the drug concentration in the system by administering a series of bolus doses: 250 mg three times a day (tid) for two days. Create a repeat dose object. Specify the amount of the dose (Amount), the dose target, the time interval between each dose (Interval), and the total number of doses (RepeatCount). You also need to set the Active property of the dose object to true so that the dose is applied to the model during simulation. RepeatCount was set to 5, instead of 6 since it represents the number of doses after the first dose at the default dose start time (d1.StartTime = 0). Change the simulation stop time to 48 hours to match the dosing schedule defined by the d1 dose object. 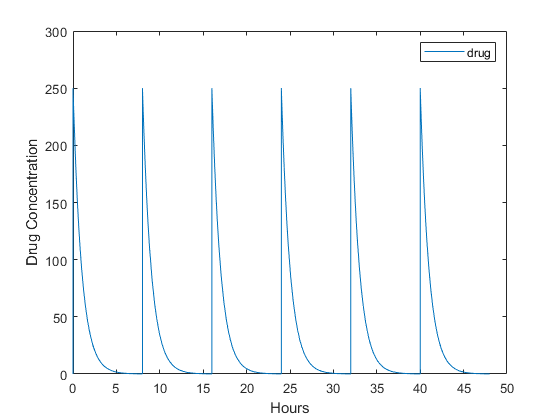 Plot the concentration versus the time profile of the drug in the system. This example shows how to set up a dosing regimen that follows the zero-order absorption kinetics. Suppose you have a one-compartment model with a species named drug that represents the total amount of drug in the body. The drug is removed from the body via the first-order elimination represented by the reaction drug -> null, with the elimination rate constant ke. In other words, the drug concentration versus the time profile follows the monoexponential decline Ct=C0e-ket, where Ct is the drug concentration at time t, C0 is the initial concentration, and ke is the elimination rate constant. 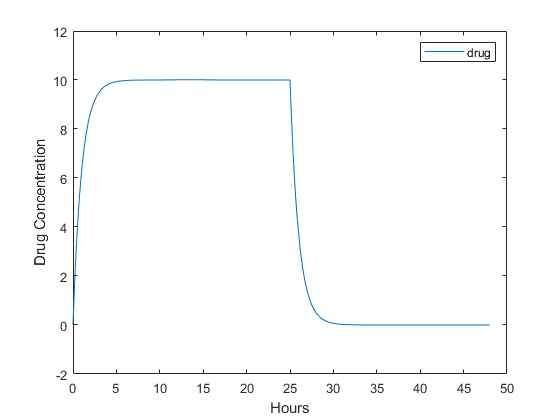 This example shows how to set up such a one-compartment model and increase the drug concentration in the compartment via the zero-order absorption that takes 25 hours to administer the total dose amount of 250 mg. The species drug is automatically created and added to the compartment. The null species is a reserved species that acts as a sink in this reaction. To set up zero-order dosing, first create a zero-order duration parameter p2 that represents the time it takes to administer a dose. Next, specify the amount of the dose (Amount), the dose target (TargetName), and the name of the zero-order duration parameter (DurationParameterName). You also need to set the Active property of the dose object to true so that the dose is applied to the model during simulation. Change the simulation stop time to 48 hours to see the complete time profile. Apply the dosing schedule defined by d1 to the model during simulation. This example shows how to add a constant-rate infusion dose to one-compartment model. Suppose you have a one-compartment model with a species named drug that represents the total amount of drug in the body. The drug is removed from the body via the first-order elimination represented by the reaction drug -> null, with the elimination rate constant ke. In other words, the drug concentration versus the time profile follows the monoexponential decline Ct=C0e-ket, where Ct is the drug concentration at time t, C0 is the initial concentration, and ke is the elimination rate constant. This example shows how to set up such a one-compartment model and add an infusion dose at a constant rate of 10 mg/hour for the total dose amount of 250 mg. Specify the amount of the dose (Amount), the dose target (TargetName), and the infusion rate (Rate). You also need to set the Active property of the dose object to true so that the dose is applied to the model during simulation. Change the simulation stop time to 48 hours to see the complete time course. Apply the dosing schedule defined by d1 to the model during simulation. Name of the dose object, specified as a character vector or string. Type of the dose object, specified as 'schedule' for a ScheduleDose object and 'repeat' for a RepeatDose object. Dose object, returned as a RepeatDose object or ScheduleDose object.